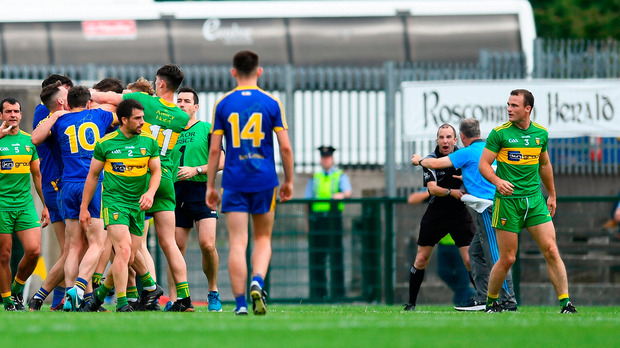 Kevin McStay could yet avoid a sideline ban for Roscommon's final 'Super 8s' clash with Dublin if he is proven not to have been sent off against Donegal. McStay was involved in an incident with linesman Niall Cullen at half-time and, according to the Roscommon manager, he was subsequently asked to "sit down for the second half". McStay was infuriated when two decisions went against his side and, after remonstrating with the linesman, he threw the ball away and it hit the official on the head. After he went into the dressing room to apologise, McStay was not sent to the stands but remained seated beside his dugout for the entire second half and left the management duties to selector Ger Dowd. "We got two dreadful calls, the last two big calls of the first half," said McStay. "Michael Murphy's point where he pushed one of our lads out of the way before kicking it over. Fair play to Michael, he's a big strong man. I have huge admiration for him, but it should have been a free out for barging or leading (with the) hand. "The one before half-time, everyone in the stadium knew that was a free. Ciaran (Branagan) was apparently blindsided. I totally accept that. "The linesman wasn't blindsided. He had a perfect view, for me. I asked him to relay the free. This happens all the time. "He just blanked me, told me to get out of his space. To be dismissed like that isn't pleasant. That was the bit that annoyed me the most. "I was a bit aggressive to him, he felt. I threw a ball. I had no intention of hitting him, it apparently landed on his shoulders, head. When that was made known to me, I came in and apologised. It was accepted, as far as I know. "The referee then told me he was going to have to go with his linesman, he says, 'you were overly aggressive and I'm going to have to ask you to sit down for the second half'." 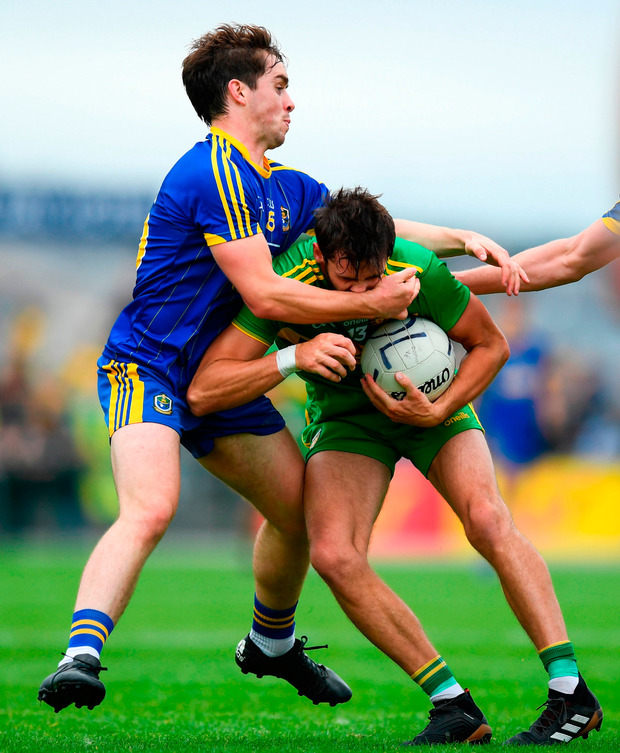 The 'Super 8s' has been a slow burner so far, but this Donegal win in Roscommon has set up a tense finish to Group 2. And, if we see Michael Murphy in this form against Tyrone, an All-Ireland semi-final slot can be Donegal's. This was a masterclass from the Donegal captain. When Roscommon were at their strongest early on, Murphy patrolled the midfield sector, acting as play maker and a stout defender. Once his side got a handle on their hosts, he moved in and out of the full-forward line to devastating effect. Nine points later Donegal's season was back on track. All around him his teammates carried a confident strut in their play. Frank McGlynn swept brilliantly in front of Paul Brennan but also plundered forward as Donegal counter attacked in numbers and at speed. After a quiet opening half, Odhrán Mac Niallais was superb in the second period and ended with four points from play and also rattled the base of Colm Lavin's post. The only negative was the arm injury suffered by Eoghan Bán Gallagher after 20 minutes. "We could have done a bit more throughout both halves but overall the lads put a good shift in and the performance was very good. The 15 starters and the six lads off the bench worked really hard," said Bonner. "We had a good purple patch and put some good scores on the board as lads like Murphy, Mac Niallais are quality forwards. "We're leaving Hyde Park happy, we'll wait to see what happens in the other game and could set up a nice match in a fortnight against Tyrone." Roscommon, on the other hand, tried to crowd the midfield sector, but mainly succeeded in starving their forwards of support. They did manage to breach Donegal on a couple of occasions early on with long, diagonal passes but that dried up too. They had some success kicking points from long range, but they were plagued by turnovers and seemed to seep scoring chances at the opposite end of the field. This was Roscommon's third defeat in the last four games and their two wins in the championship have come against Division 3 and Division 4 teams. McStay admitted his team have some improving to do. "We wanted to be in the Super 8s, we set that out as our number-one target this year and we wanted to be in it for the experience of being in it,"he said. "If we get nothing else out of it, we now know the standard of what we face in February when we turn around for Division 1. "The easiest thing would be to float around Division 2 and 3 but we want to be a part of it. Nobody said the Super 8s would be easy and we're getting the brunt of it, we're struggling to stay competitive but I thought today at least we had a good cut of it." 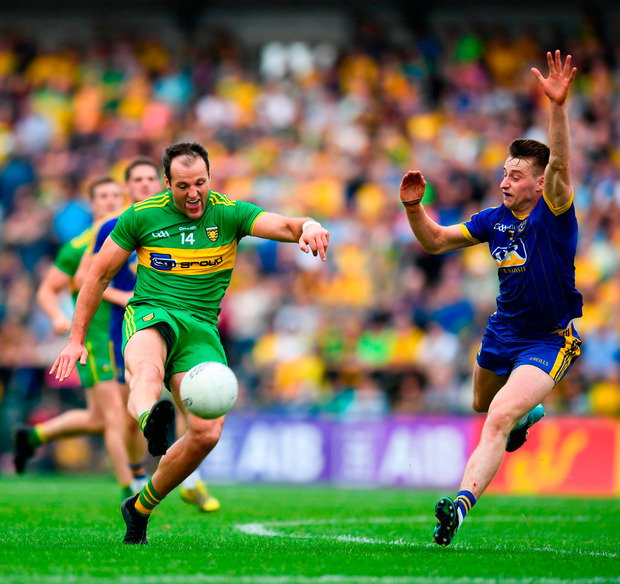 The key period in this game came in the second quarter when Donegal scored seven points without reply to open out a 0-10 to 0-5 half-time lead. Murphy was particularly influential in this period and landed three points from play, while Ciarán Thompson also had an effective spell. Roscommon stayed in the game thanks to a couple of Colm Lavin saves but, in the end, Mac Niallais and Murphy had too much class. 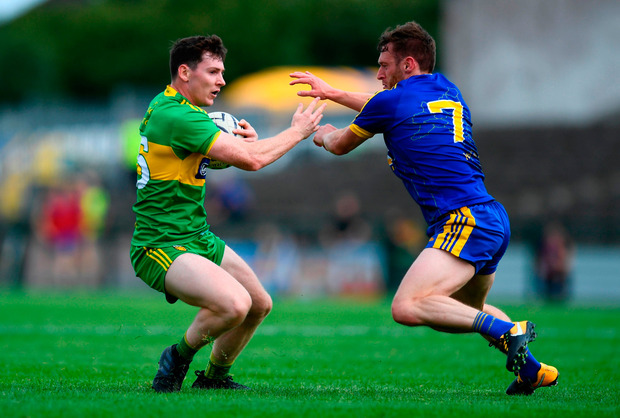 Maybe this was the week that Roscommon's back-door run caught up with them - this was their third week in a row to play - but it could be that Donegal came into this game buoyed by their performance against Dublin last week. Bonner's side tore into this game like a side that knew they came close to aceing the honours paper. 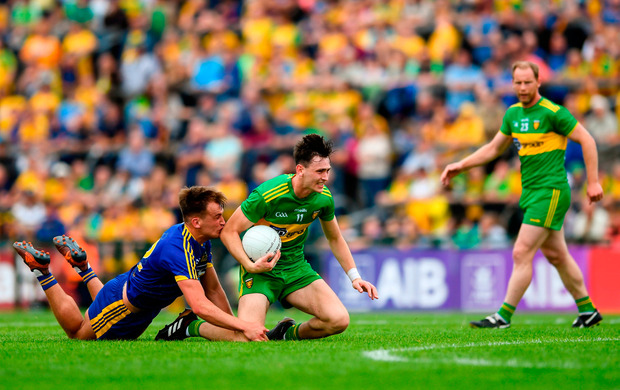 The prospect of facing Dublin in Croke Park with only pride to play for is a worrying one for Roscommon, but the battle of Ballybofey could be the classic we've been waiting for. Scorers - Donegal: M Murphy 0-9 (3f, 1'45), O Mac Niallais 0-4, C Thompson 0-2 (1f), R McHugh, J Brennan, M Langan, L McLoone, M Reilly 0-1 each. Roscommon: C Murtagh 0-5 (3f), D Murtagh, B Stack,D Smith 0-2 each, C Compton, E Smith 0-1 each. DONEGAL - S Patton 8; P McGrath 7, P Brennan 8, S McMenamin 7; E Doherty 7, F McGlynn 9, E Ban Gallagher 6; H McFadden 7, M Murphy 9; C Thompson 8, M Langan 7, L McLoone 8; O Mac Niallais 8, J Brennan 7, R McHugh 7. Subs: N McGee 7 for Gallagher (18), N O'Donnell 6 for Brennan (53), A Thompson 6 for McGlynn (54), D Ó Baoill 6 for P Brennan (62), M McHugh 6 for C Thompson (62), M Reilly 7 for Langan (66). Roscommon - C Lavin 7; D Murray 6, N McInerney 6, J McManus 7; Fintan Cregg 6, S McDermott 6, C Devaney 6 (c); T O'Rourke 7, C Compton 8; C Murtagh 8, N Kilroy 6, E Smith 6; D Murtagh 7, B Stack 8, C Cregg 6. Subs: C Lennon 7 for Compton (h-t), D Smith 7 for C Cregg (45), Finbar Cregg 6 for McDermott (48), P Kelly 5 for Stack (58), I Kilbride 5 for Fintan Cregg (61), S Killoran 5 for Kilroy (67).